Any bibliophile type who you know keeps an ever-ready heap of books close at hand. Albeit dust laden, they represent our best intentions. Often non-fiction, they await examination and in my case, awakening. I have discovered that waking up to my ignorance is, so far, the best gift of old age. It’s an opportunity that my father defined when I arrogantly offered him a technique in sales, a vocational path that he trudged for fifty years. “You can tell me anything; I know nothing,” he replied. And so it was with the book topping my lofty pile. Quiet by Susan Cain was recommended several years ago by my daughter Quinn, who in her brilliance, tends the quiet side. I read it with relish. For me, the subtitle: “the power of introverts in a world that can’t stop talking” was a cry for sanity in an overly extroverted culture. As an ambivert, I tilt the way my windy, intro/extro mood blows. Introversion is the current leaning by virtue of curated books in my stack. Along with titles on self-awareness, there are countless others that represent a craving for the natural world. And this at a time, when we appear to show up for nature only to make it our property. I have no broad evidence for this except for late and great experiences which literally have pointed me toward the settling-down beauty of the outdoors. Added bonus: there are healing revelations out there in the green which, as the cool kids say, are AWESOME. Another observation, coincidence or fact, is all about those small farmers and gardening folk who I have interviewed through the years. They are primarily souls who tend toward introversion. Sorts like my new friend and exotic fruit mentor Anthony Petrochko. A deeply cultivated individual, Anthony has a delightful obsession with the pawpaw tree. Along with curiosity, he has endowed me with an appreciation of unspeakable beauty. Unspeakable I say because his introductions have wiped away my unconscious status quo and drawn my aches and pains into the mysterious where the pawpaw abides and where creation urges our internal release. And such is the world for the boyish Anthony. “Most people describe the flavor of a pawpaw as a cross between banana and mango. To me it’s hard to describe. When first picked they have a tutti-frutti flavor and after several days on the counter, they change to caramel-butterscotch,” he said. Pawpaws are leggy trees which in shade have fan style leaves that are held horizontally. In the full sun, they are densely foliated with drooping leaves and Christmas tree-like in shape. Either way they are suited to the landscape of a Pixar film. “Picking up pawpaws, put ‘um in your pocket, way down yonder in the pawpaw patch” are the lyrics to an old time song and now more likely a ditty gone by. The song still rings true to my brownie scout days. When Anthony and I entered the public sanctuary of trees, I remembered them from youthful tromps through the woods. Not a clue in those days that the green oblong fruits were edible or for that matter a part of the blessed community. He gives his mother full credit for appreciation of the outdoors. She taught him to identify trees, flowers, birds and their song, pointing out hawks and bluebirds from the car window as he does today. And a professor at Sewanee, David George Haskell, who he calls “a de facto mentor,” fostered an awe of nature. “Really though I wasn’t that interested in plants as a young man,” said Anthony. Even during biology class, he was restless and thought plants were boring. Then fate would have it that his twelve year old son Henry introduced him to pawpaws. “‘Dad, I’ve heard about something like a cherimoya, exotic and tropical, growing in the area.’ He taught me,” said Anthony. And so Anthony considered..why not be a family who honors the intuitive message? They took a trip to the Fruit and Spice Park in Homestead, Florida. This venture was a show stopper. “Tropical fruit growing in the woods,” said Anthony. He was consigned to eat them all right there. Later his family pursued exotic fruit consumption in Puerto Rico and Taiwan. Back in Tennessee, he discovered a grove in Meriwether Lewis Park on the Natchez Trace and then a “Lunch and Learn” in Kentucky brought a series of speakers on “how to grow pawpaws.” He bagged some seeds for his own plantings. Focus has been valuable. He is a devotee of what he learned at the Fourth International Pawpaw Conference. The festival happens sporadically and no future conference is planned at this time. Sigh. In 2017 the Petrochko family took their advocacy on the road to the Ohio Pawpaw Festival. Their car sign: Honk if u luv pawpaws (y’all it’s a fruit) received 28 honks in route. 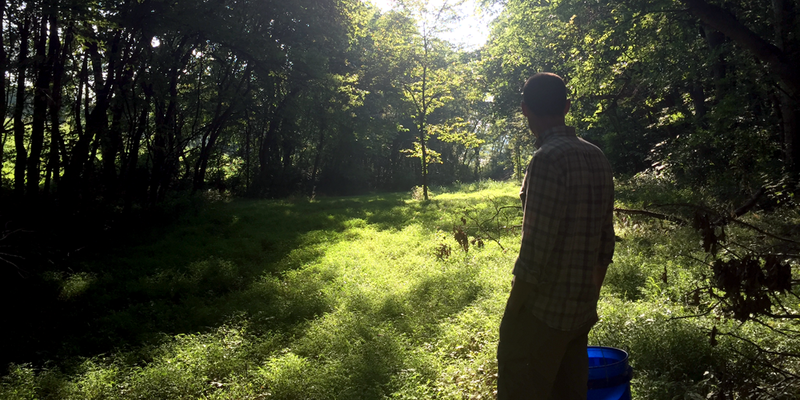 In the meantime, Anthony has planted an orchard – sixteen newborn trees installed with care on a one-acre, narrow lot off a Pre-Civil War street in Columbia, Tennessee. “They have grown three feet in one year,” he said. He is not a one trick gardener. Alongside are muscadines, a fig tree and the usual summer veggies. His wife Rachel who grew up in Taiwan appreciates the tropical fruit. “She is a wonderful cook,” he said. They are pursuing a recipe with a pawpaw custard for a Tiramisu. In the past, he harvested pawpaws for a successfully marketed ice cream at the local Hattie Jane’s Creamery. This year he called me with a gift of another strangely familiar plant from childhood. Anthony could have given me a bag of gold and I could not have treasured the beauty of a tiny maypop (passionfruit) plant more. Or maybe it’s his angelic ability to reignite wonder and take in doses of the outdoor landscape. Checking on the maypop’s gorgeous purple flower, the luscious carpenter bees that hover and the microscopic tendrils involved tend to expand life’s footprint and help me navigate my own. A beloved mentor, Wanda Turner, once told me that all the travails of life can be managed outside with a small shovel in hand. “Whenever you are sad, get to digging,” she would say. Her yard was filled with plants named by way of other natural wonder lovers. I planted Anthony’s maypop (btw edible and the Tennessee’s state wildflower) close to Wanda’s lenten roses, beside Carrie’s giant phlox, next to Lee’s forsythia. They all are shaded in a grove of gigantic osage oranges which more than likely has been on our acre for hundreds of years. The tiny Rolling Fields Circle universe reminds me of how much I have to learn about what I don’t know. Because there is plenty of quiet outside where creation whispers and then raises its voice with a reminder of what is grander and what is ever faithful. How very nice. It turns out that pawpaws take well to baking. When you spot some in the late summer; nab them and peel. Then have at it. Using a paring knife to peel the pawpaws, then remove the seeds and discard. Mash pulp with a fork. Place batter 2/3 pull in greased muffin tins and use cupcake liners. Bake muffins for 18 to 22 minutes or until a toothpick inserted into muffin can be removed without wet batter adhering.